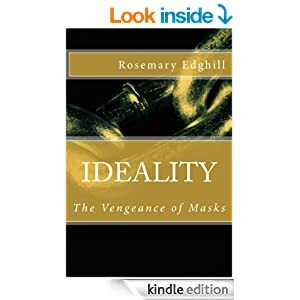 Rosemary Edghill is one of the world’s most versatile writers. She’s been reviewed multiple times at Shiny Book Review, and for good reason . . . she never seems to write a bad book, regardless of genre. For today’s “2-for-1 special,” I’ve chosen to look at her novel, IDEALITY: VENGEANCE OF MASKS and her short story collection, FAILURE OF MOONLIGHT, which feature Bast, a Wiccan detective. Note that IDEALITY has already been reviewed here at SBR under the title THE VENGEANCE OF MASKS. Only the title has changed. So my comments about it will, of necessity, be brief. IDEALITY is a novel that’s partly horror, partly fantasy, and all its own. It features Childeric the Shatterer, a character of myth and legend originally dreamed up by modern-day writer Arcadia Stanton McCauley (most often known as Cady), a fifty-one-year-old woman. When the two of their stories intersect, many unusual events occur, some incredibly violent, some surprisingly tender, and some nearly inexplicable. IDEALITY is a novel that grows on you. The writing is stellar, as you’d expect (c’mon, it’s Rosemary Edghill! ), and it varies between high fantasy courtly speech (with all its signs and portents) and, once in Cady’s point of view, is told in a contemporary, direct and sometimes snarky commentary. This juxtaposition is interesting and rarely seen in contemporary works of fantasy and/or horror. Mind you, the horror element in and of itself unusual, and yet is strikingly modern all the same, while the storytelling in both sections (Childeric’s and Cady’s) is exceptional. Don’t miss IDEALITY, one of the most original works of fiction I’ve read in the past fifteen years. 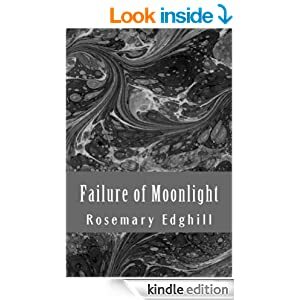 Next up is FAILURE OF MOONLIGHT, which is a short story collection featuring Bast, perhaps Ms. Edghill’s most popular character ever. ** Bast is a Wiccan priestess from New York City who struggles with her faith, solves murder mysteries and is one of the most intelligent characters in or out of detective fiction. “Advice from a Young Witch to an Old Priestess:” This is about Bast’s first experiences with the Wiccan faith. She wants to learn, there is a procedure as to how you learn from people already initiated in the Craft, and yet it can be tough to get started due to the secrecy of the people already involved and the hoop-jumping required to show your bona fides before you ever get a chance to prove yourself as a dedicated student. In addition, Bast’s relationship with a male NeoPagan, Lark, is a big part of the plotline — why this is so is all bound up in Bast’s faith, and how she admits she was searching for answers, and wasn’t quite ready for what she found. Mind you, this is the one Bast story extant where Bast doesn’t solve an external mystery. The mysteries here are all internal instead. Why is Bast putting up with the exceedingly immature Lark? Why has she bought into the concept of Free Love (as this story is set in the early 1970s) without a qualm? And why does it takes her a while to figure out that faith and responsibility go hand in hand? Ultimately, this is an interesting story of an extremely intelligent woman who admits she’s flawed and made mistakes trying to find her feet in a faith that’s not exactly commonplace. Watching her make these mistakes as they happen is sometimes uncomfortable, but that’s because it’s easy to identify with Bast’s plight despite her unusual religion — or because of it. “The Iron Bride:” This Bast adventure is a straight-up mystery. Who has killed pagan swordsmith Wayland Smith? For what purpose? And will the police ever believe Bast once she figures it out? This story is perhaps the strongest in the collection because of several things. Bast is a smart woman who makes wisecracks and uses her knowledge of the Wiccan faith to solve murders no one else is likely to solve quickly (or perhaps at all), and there is a logical progression she follows that explains just who killed the swordsmith and why. “A Winter’s Tale:” This is a conversational story between Bast and Lark while they both work at an occult shop in New York City. Lark had run across a very strange occurrence years ago, and wants Bast’s opinion — Bast, of course, would rather be anywhere else, but she needs the work and there’s a snowstorm outside anyway, so she listens. Slowly, the story emerges, one of horror and faith intertwined . . . and a monkey’s paw is invoked (in both senses) by someone who has no idea what she’s doing, upping the complexity and the horror factor immediately. This is a gripping story for all it’s “shaggy-Witch” quality, and it’s easy to see why Bast’s attention is arrested. “Burden of Guilt:” Here, Bast helps out at an upscale pagan festival in upstate New York. This particular brand of paganism does not appeal to Bast, as she views it as a sellout: if enlightenment visits this festival’s participants at all, it has to be accidental. The main purpose of this festival is to separate the well-heeled from their money while making them feel good at the same time. She hates being there, and would not be if she didn’t need to make money to pay her rent, but ends up having to deal with a murder . . . Marcie Wheeler ends up dead, and a ghost named Edward Madison is blamed. Of course, Bast figures out (by doing her research) that there never was an Edward Madison anywhere around this particular establishment. So someone has deliberately spread this rumor — why do so, and for what purpose? Ultimately, the mystery is straightforward. The police probably would’ve figured this one out on their own, as there’s a particularly mundane reason for the murder (that I refuse to spoil), but because Bast is the first to do so, she’s in danger. How will she get out of trouble? And will she ever forgive herself for making money at this particular establishment, considering they’re doing any number of things she outright despises? The last two stories are different. The first one, “A Christmas Witch,” is a pagan fable for young readers. Rowan is Wiccan, and wants to celebrate the winter holidays just like anyone else. But her family hasn’t explained what they do to celebrate the holidays, instead telling her to wait and see . . . and like any young child, this does not go over well. Ultimately, Rowan figures it out and is left satisfied. This is a cute story that I enjoyed very much; it’s short and pithy, very different in tone than the four “Bast” stories, but welcome all the same. The final story is an essay that was originally included at the end of the first full-length Bast mystery, SPEAK DAGGERS TO HER. Ms. Edghill explains what her motivation was for writing this book — an old, unsolved mystery that she’d always wanted to explore, that just did not leave her alone no matter what she did. FAILURE OF MOONLIGHT — A. This entry was posted on February 27, 2014, 5:41 pm and is filed under Book Review. You can follow any responses to this entry through RSS 2.0. You can leave a response, or trackback from your own site.